If you've been thinking about getting a sound recorder for your lessons, conferences or anything else, maybe you can try this Easy Voice Recorder. The name itself says that it is easy to use, but quite efficient in various situations. Try it! 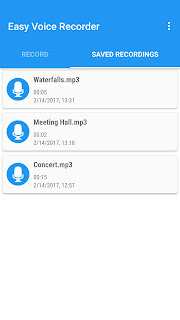 It would be great to add synchronization with Dropbox and Google Drive to get access to voice records from anywhere and anytime.